B1 Normal score was pushed to 55,8 million points. It was a bit rushed and isn't one of my better plays, but I'll still go through the run to give a rough idea of the contents. I don't plan on improving the score for now, but I want to improve it significantly in the future. Stage 1: Pre-Daiyousei is routine, but the entire stage portion, including Dai's third nonspell, was very good. I got every 30% area, and start Sunny Milk with 289% PF. Sunny Milk: Execution a bit shaky on the second nonspell, but the luck was good during the fight. Overall a great stage 1. Stage 2: Start with 7,31m, 363 motivation, 165 PF. I somehow start stage 2 with a higher score than the B2 run, despite having 2 less suicides and 1 less bomb! Unbelievable, it was truly the best Normal B1-1 I've had in my life. Stage 2 is much worse. The entire first half is full of freezes that are below my aim. Just to get this out of the way first, Lily White is the most difficult midboss in terms of balancing damage distribution with score gain. Greed is of course important to reach the highest scores, and greed has caused the 1st and the 2nd nonspells to have been defeated early so many times. On the 1st nonspell, there is a strong luck element with damage, whereas in the second nonspell, you're forced to get lower freezes the lower on the screen Lily goes. Lily White nonetheless went quite well. 2 suicides and 2 bombs are distributed, and my PF is far above the minimum. Star Sapphire: I find that Star is the make or break it part of this run, particularly the second nonspell. Let's fast forward to that. Star's second nonspell is intensely luck based and difficult to optimize, some of my freezes being only ever so slightly off resulted in very high score loss. However, I did get fair RNG. Stage 3: Start with 24,94m, 556 motivation, 123 PF. 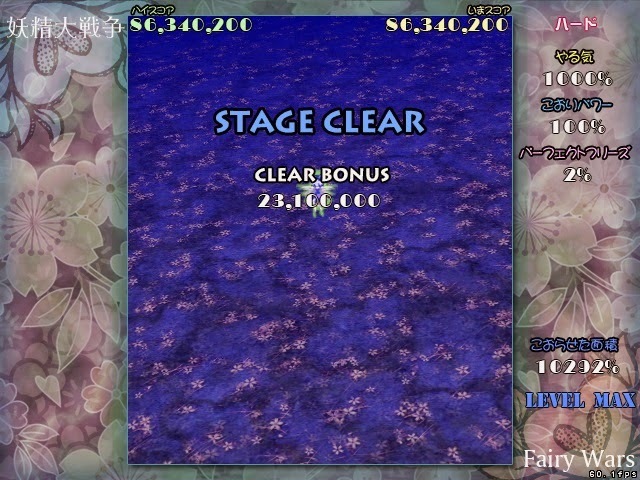 I think clock started with 25,6m and Star's second nonspell is the cause for this disparity. I do use less suicide on it, since reducing the damage dealt isn't necessary, so I have more motivation. There is little to say about most of the stage. It went well enough, up until the Knife Ring section, which I botched pretty hard. While it could have been possible for me to save a life here and still reach 100% PF for the end of stage spam, when I completely missed a 30% area I went with the suicide plan instead, which was more than fine considering my motivation was so high. 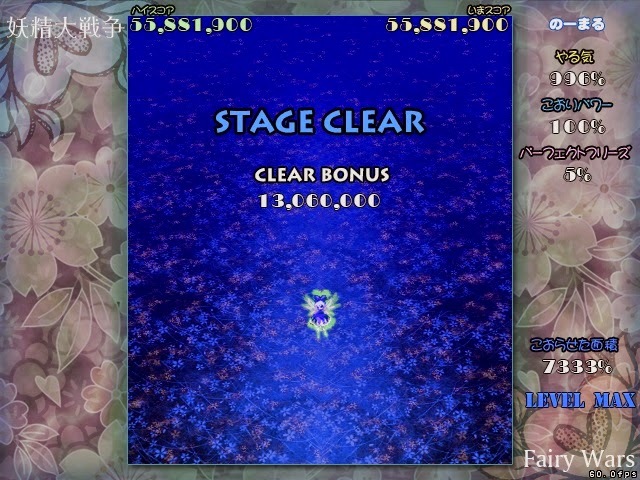 3 Fairies: Start with 30,94m, 710 motivation, 11 PF. With these resources, I can distribute a non-essential suicide, that is nonetheless an useful suicide for reaching the maximum number of bombs. This suicide is non-essential because reducing the damage dealt on any of the attacks in the first of half of the fight is unnecessary, but I need to spend the life because otherwise I'll get to 1000% motivation. First Nonspell: Smooth, I get the items quickly and spend most of it gathering that delicious Luna milk. Life is spent here. Bright Night: I milk this card. It is highly based on luck, since the longer Star and Sunny are kept alive, the better the milk. At the end of the milk, I spend a bomb. Ice Dissolver: life is lost on accident here, rendering the previous suicide quite useless. 3rd nonspell: I use my "keep Sunny alive" strategy but I don't manage to get the big freeze at the end so she is kept alive for longer than planned . That is not a run ender, and I gather her items from Break Canopy instead. 4th nonspell: I want to milk this efficiently but I am completely unable to. This is where the run "fell apart". I kept dying on accident, but somehow the route was still intact! Last mistake is on Fairy Overdrive, where I only get 1 frozen item set. LNN was achieved on A1, B1, B2 and C2. Because A2 and C1 were already achieved, that means all routes were completed. For non-weebs reading, LNN means clearing without dying or bombing. I am not the first to achieve this feat, EOH had already done all the routes, but my replays (being rather different from his) are still worth the watch for anyone interested in FW survival play. It was an enjoyable challenge. However, despite being enjoyable, it lacks contents in the challenge. LNN can be achieved fairly effortlessly if you already have a high score, and how can you "improve" an LNN, other than going for a higher score (redundant) or add more challenges (arbitrary) ? It is still satisfying accomplishment. 86,3 million was achieved in A2 Hard. This was a highly shaky run, where I do almost everything as well as my knowledge allows me to. There are very few "conscious" mistakes. The score loss is almost entirely lack of optimization knowledge. The score is not a world record, but the aim is to at least overtake the WR, and maybe push a bit further. 88 million may be reasonable, but it does sound a bit high. 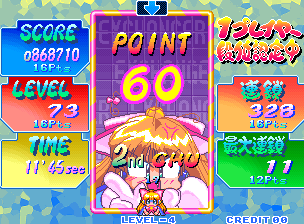 Lastly, 868,000 was achieved in Money Idol Exchanger's solo mode. I play this pretty regularly, for little chunks at a time. The goal is a million.